There are a number of factors which need to be considered before undertaking an installation of an induction loop. The key points below need to be considered before proceeding too far with a scheme which ends up fails to perform correctly. Before all else it needs to be considered if the location and manner of use for the proposed AFILS system is in fact, practical. There are many induction loops being specified for buildings and construction projects to satisfy DDA requirements, where there would be little to no practical benefit for an actual user. Ensuring the proposed system is in fact a benefit is important to ensure a complex, costly and time consuming installation does not prove to be an expensive waste of time. What actual speech content or source needs to be enhanced? For what length of time would a user listen to the content? How can a perimeter loop cable be installed within the room or space? Is confidentiality of any spoken word in the system a requirement? How could a multiple loop array be laid across the floor or ceiling of the room for low overspill? Is there a presence of sodium or metal halide lighting in the immediate area of the proposed loop? Would infra-red be an alternative solution? Is the venue capable of managing the issue, retrieval and maintenance of IR receivers and their batteries? The key point to remember is that the hearing aid user hears what goes through the microphone – both the speaker’s voice and any background noise. To benefit from induction loops the speaker’s voice must ALWAYS be close to the microphone to ensure that it predominates over background noise. Sometimes a public address or sound system may already be installed which may be used as the sound source, or perhaps a more sophisticated arrangement may be planned with inputs from various sources. In the absence of an existing sound system it will be necessary to provide microphones and inputs to the loop amplifier for any other signals. When microphones are to be used it is vital that they are positioned to pick up sound, which is free from reverberation and other noises. If the microphones receive a poor signal then the signal transmitted to the listener will be poor no matter how good the design of the loop and other equipment. It is also necessary to ensure that the microphones are matched electrically to the amplifier so that it is ‘driven’ adequately when the loop is in operation. 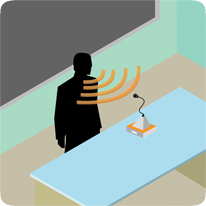 When positioning microphones in rooms, the microphones should be as close to the person speaking as is practicable, for example in a classroom if the microphone is placed in the ceiling in the room centre, the loop microphone will be further away from the speaker than the microphone in the hearing aid of someone sitting on the front row of the class! All loop installations in the UK should conform to the Code of practice BS7594, this gives advice on the minimum areas to be covered, positioning of microphones and commissioning the system. Systems should be set up and tested to the requirements of EN 60118-4 which lays down requirements for magnetic field strength. Copyright 2018. PAS Sound Engineering Ltd. All rights reserved.